Once in a great while there is a dish that reaches out and grabs you by the taste buds and reels you in so you never forget it. The miso-grilled black cod at Yoshi’s Japanese restaurant in Oakland was just such a dish. The lusciousness of the fish, the sweet-salty taste of the miso marinade and the smoky char of the grill combined to make a memorable experience. It was the memory of that dish that made me decide to buy The Food You Crave by Ellie Krieger. I’m reviewing the book for Paper Palate (here's the link) and I wrote about her Double Chocolate Pudding Pie with my S’More Topping Option here. 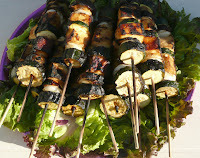 Note: Feel free to add more veggies to each skewer or substitute vegetables. The below just recaptures what I did. Veggies and tofu should be cut about the same size so they will grill evenly. Hard or long-cooking veggies should be partially precooked in the microwave or steamed. If the skewers are wood or bamboo, cover them with water to soak for about a half hour or more. Make the miso marinade (see recipe below) and set aside. Slice or cut the onion into appropriate sized pieces. Put in a microwave safe dish with a tablespoon of water. Cover and microwave for about a minute or so until the onion pieces have just begun to soften. Set aside. Thread the kebabs. I used a slice of zucchini, a piece of onion, a tofu chunk, another slice of zucchini, another tofu chunk followed by a second chunk or ring of onion, capped off by a fresh shitake mushroom cap. Lightly brush the marinade over the vegetables and tofu. Cover and let the flavors absorb for at least a half hour or up to several. Oil grill. Heat grill. Place kebabs on grill. Brush miso marinade on the kebabs. Grill, turning and brushing more marinade on as needed. When the vegetables are cooked through and the tofu is nicely charred, remove from grill. Serve with a splash of soy sauce or Chinese black rice vinegar if desired. Pass chili paste on the side (optional).